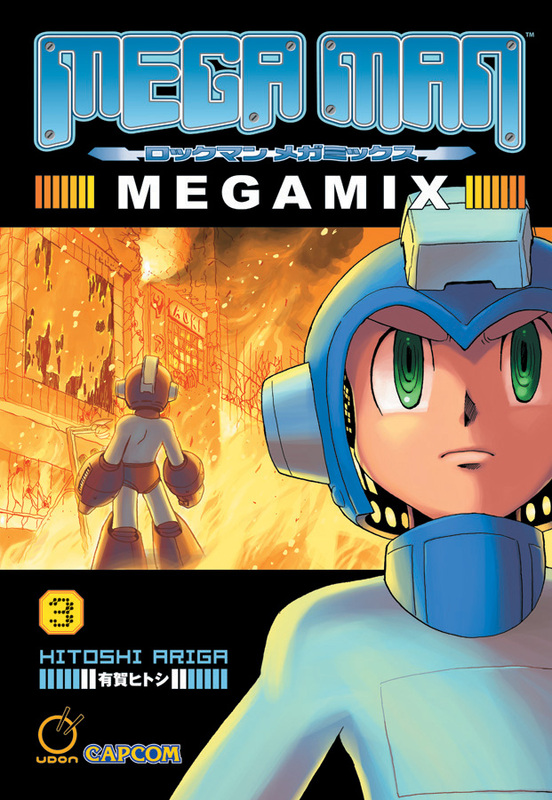 As per usual, our pal at Udon Entertainment, Matt Moylan, sends word that the anticipated Mega Man Megamix 3, the third and final volume in Hitoshi Ariga's Megamix series, will be hitting comic stands on November 17. Other retailers, such as Borders and Amazon, will stock the book within two weeks after that; but otherwise, volume 3 is good to go on the 17th. In the meantime, you can check out a couple sample pages at the official Udon blog here! Additionally, Matt also wants me to pass along the following message: "UDON will soon be announcing a bunch of new Mega Man projects. We’ve got new books being localized from Japan, new UDON original projects, and yes you will finally get to see the UDON crew drawing our take on the blue bomber." Matt didn't divulge into specifics, but these projects are kicking off in 2011. That final tidbit certainly sounds like a hint that Udon will be produce their own, original MM comic, which is something I think would be greatly appreciated. I would not be surprised if Gigamix turned out to be one of the new localizations; I wonder what else they might be bringing over. More art/source books? The much demanded Iwamoto X manga? Who knows! More details in the near future, hopefully. Thanks for the heads up, Matt! I'll believe Megamix 3 being released in November when I see it. As for other Megaman projects, hot dog! Obviously we'll be seeing Gigamix at some point. Besides that, we have, what, the X and Zero mangas? Anything else we're missing? And I'm definitely intrigued about UDON's "take" on Megaman. Original comics, perhaps? Would be interesting to see, considering Archie is getting into the Megaman comics biz in 2011. Yeah, sounds interesting. Looking forward to it guys! Thanks again for bringing all this stateside! Iwamoto Rockman X manga PLEEEEEEASE udon! Haha, this is truly awesome news but I wonder how much of this enthusiasm is due to the fact that Archie is getting headlines for leading a MegaMan comic instead of them. I've spoken to Udon every single time they come to Seattle for PAX and Sakura-con. I talk to them for hours and buy several hundreds worth of their stuff every year. The director guy knows me and everything. Every year I ask them at length about MegaMan projects, and every time they give me the same answers.. "we can't do it, the Dreamwave comic didn't do well with the fans, it's too early to put another one out yet, there isn't retailer interest for MegaMan yet". They told me all this stuff as recently as last August, for PAX. I can understand some of it, but part of it always sounded like excuses. X manga please! Or Gigamix! Or maybe Battle Story. I can do without the Zero though. *eyes narrow* So, wait, Archie's doing a comic and... so is Udon? Are we sure this isn't one and the same thing we're talking about here in some kind of freakish merger? Granted I don't think I'd mind it, but it'd feel a bit like overkill if both companies were putting out a western made comic at the same time. Don't forget Ikehara's mangas! And the 4 koma mangas. Hope they bring the X mangas here. Hardly anyone's translated those. Considering I have yet to see Megamix 2 at bookstores, I'm not holding my breath.